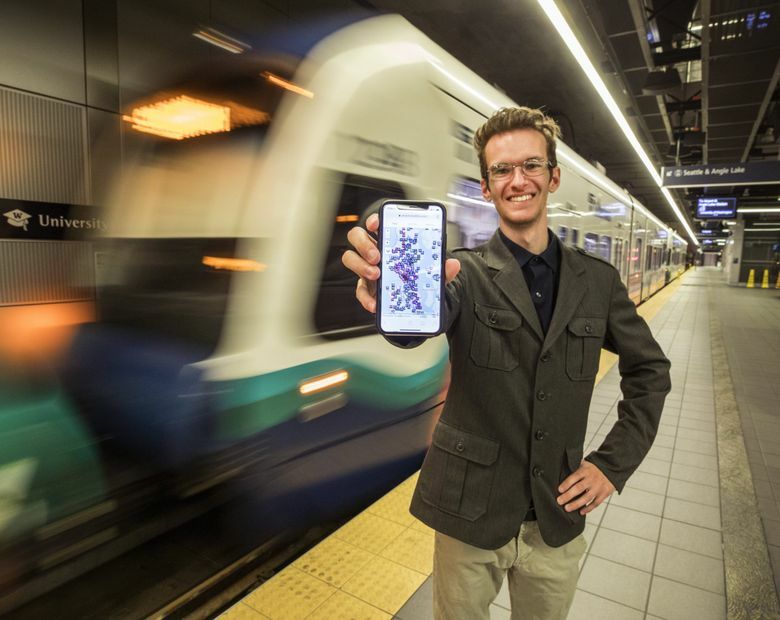 University of Washington junior Kona Farry has, so he built a website, unveiled late last month, that lets transit users track the whereabouts of all the buses, ferries, streetcars and light-rail trains in service in the Seattle region. His website, called the Puget Sound Transit Operations Tracker — or P-Track for short — uses GPS and other data publicly available from local and regional transit agencies to plot the positions of buses, trains and ferries along their routes. “It was born out of a desire to be able to see all the buses all at once and know what’s going on with the system,” said Farry, 21, who studies community, environment and planning at UW. For hard-core transit enthusiasts, information about each vehicle’s make and model, unique identification number, and even the size of the vehicle is available in the website. P-Track lets riders see how individual buses are moving along a route as opposed to getting an estimate of when the bus will arrive. It also says whether a bus or train is running behind or ahead of schedule. For example, if you’re waiting for a bus on Third Avenue downtown, you can open up P-Track, input the route you are tracking and see that your bus is still making its way through Pioneer Square. That can provide riders with additional information: Your bus is on its way, but it might take 5 or 6 minutes to get to your stop. On his site, Farry considers a bus on-time if it arrives between 2 minutes early and 5 minutes late. That’s the same as Metro’s definition. “I pretty much had to learn everything as I went,” he said. Farry said he became a self-described “transit geek” in the fall of 2016 when he moved from Marysville to Seattle for school and got to thinking about how to make transit work better. He regularly takes King County Metro’s Route 45, which runs between Loyal Heights and the University of Washington light-rail station. Farry also rides the Sound Transit Express Route 512 to Everett, where he then switches buses to get home to Marysville. And he sometimes rides Community Transit commuter buses between Snohomish and King counties. In future versions, he’d like to add a traffic overlay so riders can see traffic conditions that could delay their trip. Correction: A previous version of this story stated that the transit tracker OneBusAway does not show how buses are moving along a route. In fact, that information is available within the app.